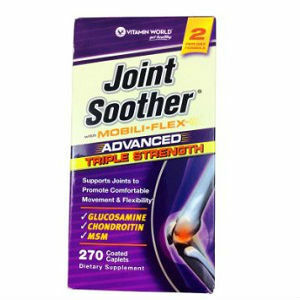 Vitamin World Advanced Triple Strength Joint Soother features Glucosamine, a key ingredient for cushioning joints and restoring cartilage. Amounts were not provided in the product source for all the ingredients listed above. Take two (2) caplets daily, preferably with a meal. $56.49 for 180 caplets (90 day supply). Free shipping for orders of $75.00 or more. Vitamin World has a return policy that allows returns for at least a partial refund for up to 90 days from the date of purchase. The product price is affordable (90 day supply for less than $60.00) and Vitamin World has a reasonable return policy. No reviews have been posted yet for this product on the vendor’s website. Mark Stevens	reviewed Joint Soother	on February 25th	 and gave it a rating of 2.5.